What Does The Middle Pedal On the Piano Do? There has never been said any words in the piano industry that are more divisive than “But does it have a middle pedal?” Why are these words divisive? Because the middle pedal on the piano is the least used and yet most focused on in the piano industry. 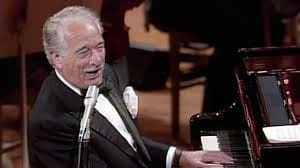 I’ve often told the story about one of the greatest jazz pianists in my city, when he was just signing the papers to purchase a beautiful grand piano, he stopped and turned to me and said, “Glen, I’ve just got to ask… What does the middle pedal do? I get asked because I’m viewed as the professional and yet I don’t even know and I’m too embarrassed to ask! Can you please tell me?” We both had a bit of a laugh because he’s an incredible professional musician who has existed for decades without even knowing what it does. After technically showing him he then said “When would anyone use that?” Precisely my point.The middle pedal on the piano, if you would break it down into frequency of use might possibly be 98% for the right pedal, 1.9% for the left pedal and maybe (if you’re lucky) 0.01% for the middle pedal. The right pedal, the sustain (also known as the damper pedal) is used with every musician and every player because it lifts the felt dampers and sustains the notes and keeps the strings resonating even after we have lifted our fingers. In essence it “fills in” the sound. The left pedal, the “una corda” pedal changes the dynamic (volume) level of the piano and/or the timbre of the tone – making it the soft pedal. But the middle pedal… ahhh yes the infamous middle pedal has been known to have 5 different usages. In this article, we’ll take a look at the advantages of the middle pedal and why it’s not the best decision to judge a piano based on this non-standard device. Pianos equipped with the sostenuto function are what I would call “selective sustain”. While the right pedal sustains all the notes, the sostenuto, in essence holds down selective notes you wish to sustain. I love how this chap in the U.K. both demonstrates and performs on the piano utilizing the sostenuto pedal. He beautifully shows both the function and form of the sostenuto. As you could see in the sostenuto video, most of the time, the sostenuto pedal is used to sustain the bass notes. So why not make a pedal that just sustains the bottom notes? Some manufacturers decided instead of offering a sostenuto pedal (which is more labour intensive in manufacturing) they would offer a type of split sustain. The middle pedal would then act like the a sustain pedal for just the bass notes. Herein lies the big departure for the middle pedal as it has absolutely nothing to do with sustain at all and yet can be found in most modern upright pianos today. It is called the practice pedal, the practice mute or the “celeste”. The purpose on this middle pedal is to reduce the volume of the piano by sandwiching a thin layer of felt between the hammers and the strings. Take a look at this 10 second video and you’ll get the idea. This is neither a sostenuto nor a bass damper. It doesn’t function like the above pedals. It simply is meant to mute the entire piano (much more than the soft pedal). With modern manufacturing, the middle pedal has also been used as the silent pedal while simultaneously engaging an electronic device to allow you to listen to your piano with headphones. Known as “silent” or quiet option, the middle pedal blocks the hammer from striking the strings. What you will hear then is a slight knocking from the hammer shanks (the “handle” of the hammer) against the silencing rail. Underneath each of the keys are infrared sensors that determine what notes are being played and transmit signals to an electronic device which makes the digital piano sound come out of headphones. For night time playing or extreme privacy, these pianos are brilliant. I have to admit (and am thankful to say this) but I haven’t seen a “novelty” brass tack rail for many years. Similar to the practice mute pedal, the novelty rail lowers a series of brass tacks in between the hammers and the strings and makes the piano sound like a honky-tonk piano. Alternatively, I’ve also seen pianos that are connected to… nothing. Nothing? Yes nothing. Why would a piano have a middle pedal connected to nothing? The answer is simply that customers wanted a third pedal. Cosmetically, it may have satisfied some consumers but opening up the piano I have on more than one occasion seen pedals with no function whatsoever. They’re pretty rare though, but provide a bit of a laugh when you’re asked to fix the middle pedal. Today’s manufacturing world mainly has evolved to having a standard sostenuto pedal on grand pianos and a practice mute pedal on upright pianos. Regardless, it’s probably not the best choice to base a piano decision on the middle pedal. As a friend of mine once said “it’s like buying a car based on the radio antenna”… referring to the obscurity of use. According to Fred Sturm in his paper “The Invention of the Sostenuto Pedal”, he writes that pianos used to have many pedals (upwards of 7!) during the early 1800’s when there was more experimentation around the piano. 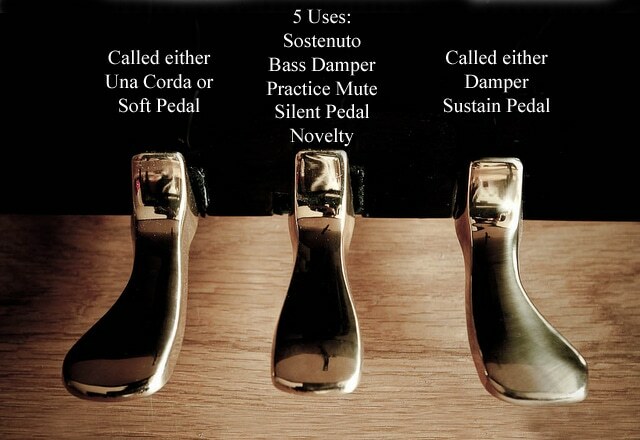 The sostenuto pedal was patented in France by the Boisselot brothers in 1843-1844. “Sons soutenus” simply translated means “sounds sustained”. After another piano maker, Montal exhibited pianos with this pedal function in the mid 1800’s World Expositions, this invention was given more exposure. 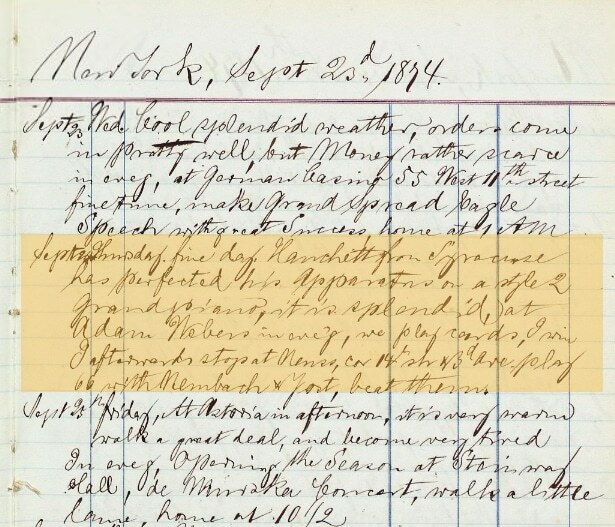 Fast forward to 1874, a patent was presented in the U.S.A. by Mr. Waldo Hanchett. In his diary (shown above), William Steinway commented after viewing this invention that it was splendid. 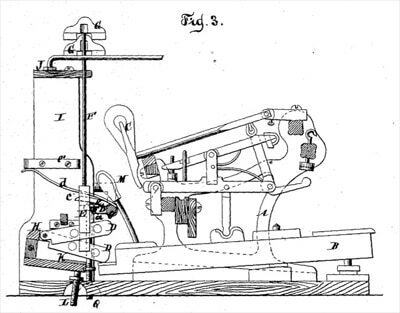 After some legal and patent disputes, Steinway re-designed the pedal and forwarded a patent in 1875 for the sostenuto mechanism as we know it today. If you have the time, check out Fred Sturm’s paper – a fascinating read. As previously mentioned, the main idea is usually to sustain lower notes while changing chords in the upper register. When you depress lower keys and then press the sostenuto pedal, they create a foundation of sound from which you can then superimpose other chords on top of without affecting the selected lower notes. But what happens if you don’t have a sostenuto pedal? What if you have an upright piano with a practice mute? The work around is that you can get a similar effect by half pedalling the sustain (right pedal). Since the lower notes vibrate with greater energy than higher notes, if you half pedal – meaning that after you depress the sustain pedal, you only come up until the dampers slightly touch – you can still keep the energy of the bass strings and clear the top notes. It’s not a true sostenuto but it accomplishes a similar effect for the rare times that it is needed.